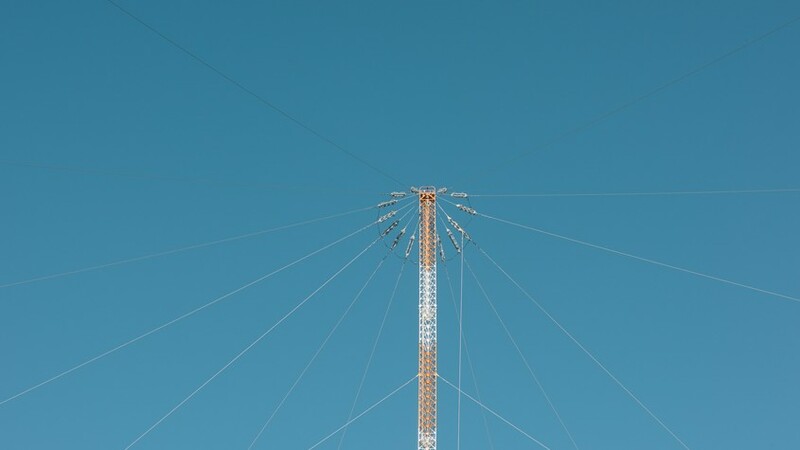 Standing 432 metres (1,418 ft) high, the Omega Transmission Tower in Darriman, Victoria was the tallest structure in the Southern Hemisphere until its demolition in April 2015. 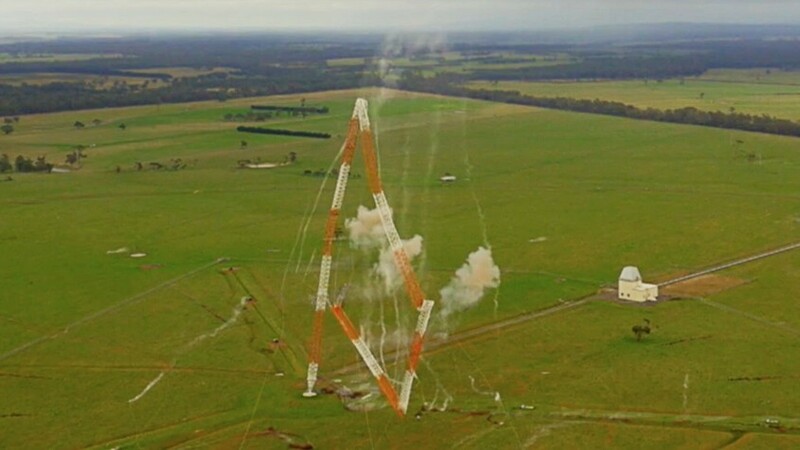 Contracted by the Department of Defence to carry out the demolition, Liberty Industrial used controlled explosive techniques to bring the redundant Naval communications tower to the ground. Tight time frames were imposed by the Department of Defence for the delivery of the project with Liberty Industrial contractually bound to complete the demolition of the tower within 6 weeks of the contract award date. The project team, including experienced explosive demolition experts, structural engineers and a licenced shot firer, promptly began planning and engineering a detailed work methodology for the controlled explosive demolition of the structure. Leading up to the demolition, Liberty Industrial’s project management team worked closely with state and feral government health and safety agencies, Commcare and Worksafe Victoria, to obtain the required explosives approvals in timeLiberty Industrial’s project management team prepared a comprehensive Blast Management Plan, an Explosives Security Plan, a Demolition Work Plan and other documentation critical for safely managing demolition works involving the controlled use of explosives. In order to meet the tight project time constraints imposed by the Department of Defence, we worked with a local explosives supplier to utilise the explosives they had available, namely PE and Composition B. We spent two days testing explosives at a firing range. We tested the available explosives on steel plates fabricated to replicate the cable support stay plates we were planning to sever with the cutting charges to determine exactly what depth they could confidently cut through. After the testing days, we were satisfied that we could at least severe 50mm thick plates with the Comp B explosives charges. However, to ensure that we had some redundancy in the charges, we decided to undertake preparatory oxy cutting on the cable stay support plates to ensure we had a maximum of 40mm thick steel to cut. With some of the cable stay support plates up to 80mm thick at the outer most support, we utilised GHD Engineering, our preferred Structural Engineering company, to complete a full structural review on the tower and its support stays, to develop a preparatory cutting scheme that ensured we had no steel thicker than 40mm to explosively cut, whilst ensuring the tower remained structurally sound until the cutting charges were initiated. In the days prior to the implosion, oxy cutting works were carried out to prepare the twelve designated cable support stay plates. Precision and accuracy were paramount to ensure the tower remained structurally sound and to prevent an uncontrolled collapse. We also carried out the controlled release of one of the 1.5 kilometre aerial cables to prevent collateral damage to existing buildings that were to remain on the site. 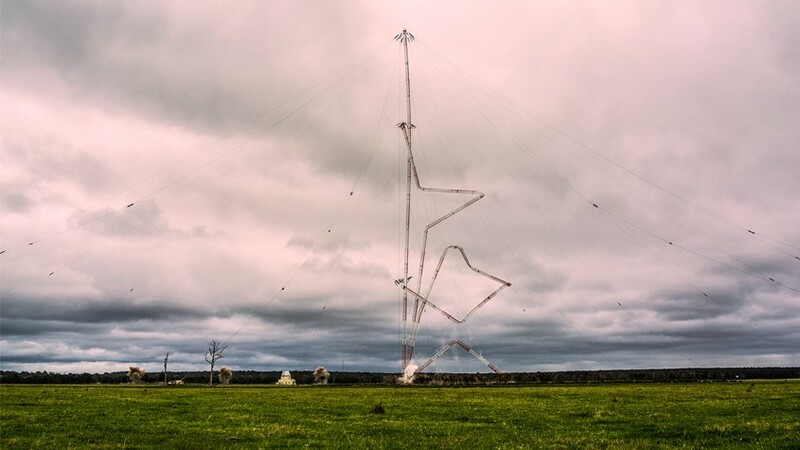 We utilised a second aerial cable which we had released from the opposite side of the tower and a 36t excavator to secure the tensioned cable, before separating it from its anchor. We were able to control the release of the cable by tracking it in with the excavator to ensure it was clear of the retained buildings. 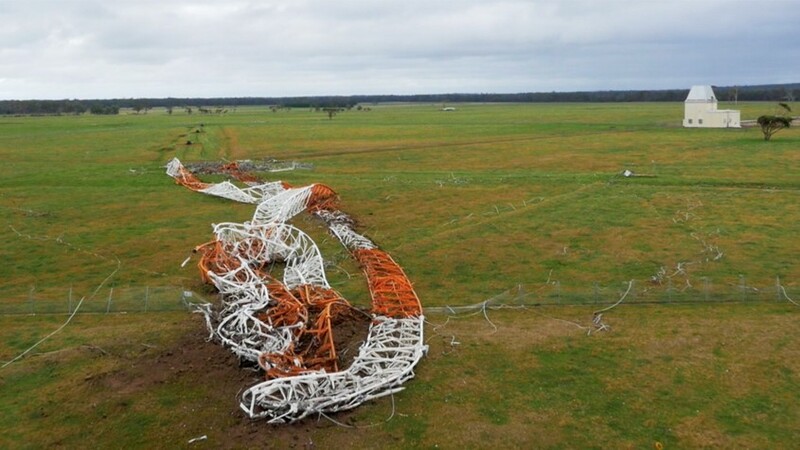 All other guys and aerial cables were retained to maintain the structure’s stability. The day before the implosion, the explosives were affixed to the twelve designated anchor plates and all necessary checks were carried out in line with the Blast Day Management Plan. Two security guards remained onsite throughout the night to ensure the explosive’s remained secure. On the day of the implosion, we established a 1,000m exclusion zone around the tower, halting traffic on the adjoining highway for a short time while the demolition was undertaken. Representatives from Victoria Police, WorkSafe and the Department of Defence attended the demolition to observe, record and support the project. Comprehensive planning, calculated engineering and careful preparation delivered a successful outcome for Liberty Industrial’s project team, with the implosion precisely executed and the structure safely grounded in a matter of seconds, reacting as planned and anticipated. 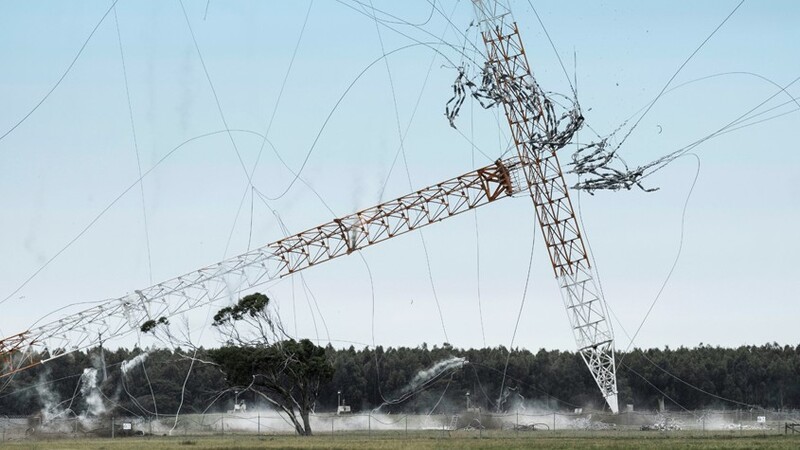 The cutting charges successfully severed the plates, releasing the guy cables and causing the lattice truss tower to destabilise and collapse upon itself in four large sections. Once the site was clear of debris, a 36t Volvo Excavator with a bucket attachment was used to decontaminate the area that surrounded the felled tower, removing 100mm of topsoil from the area as a precautionary measure, to ensure the site was free of any lead based paint contaminants that may have been released from the structure’s lead paint coating exterior with the impact of the collapse. Soil test results were provided prior to demobilising to certify the area was free of any lead paint contamination. 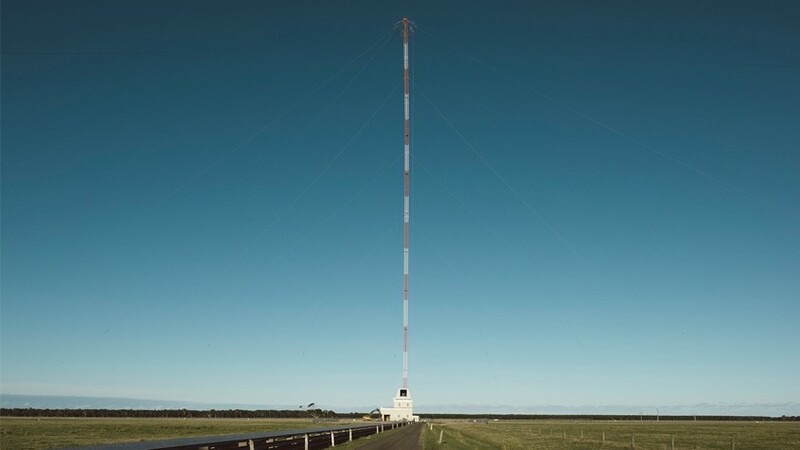 The 432m Omega Tower is the tallest structure demolished in the Southern Hemisphere to date. This project was awarded the Explosive Demolition Award at the 2015 World Demolition Awards.